SECRETARY RUMSFELD AND POLISH ARMY GENERAL TYSZKIEWICZ at a ceremony at Camp Babylon, Iraq on September 6, 2003. This ceremony took place during the transition of south-central Iraq from the 1st Marine Expeditionary Force, to the 29 nation, Polish led MultiNational Division. I was at this ceremony and took this photograph. General Sanchez addressing the Change of Authority ceremony in Camp Babylon, Iraq on September 3, 2003. The ceremony signified the operational change from the 1st Marine Expeditionary Force to the 29 nation MultiNational Division South. The ceremony took place on the site traditionally believed to be where the legendary Alexander the Great built his stadium. The next picture is of Colonel Michael Whitehead observing the ceremony from the stadium seats. The final image is of my good friend Leo Rivera at the ceremony. Unit picnic at Camp Babylon with the newly arrived Polish troops on July 27, 2003. I am the one wearing the hat. To my left is Lieutenant Colonel Mariusz Saletra, a friend of mine from the Polish Army. U.S. Army Civil Affairs officers Lieutenant Colonel Leonardo Rivera and Lieutenant Colonel "Diesel Joe" Smith brief incoming Poles on the situation in south-central Iraq. The briefing took place at Camp Babylon on September 2, 2003. 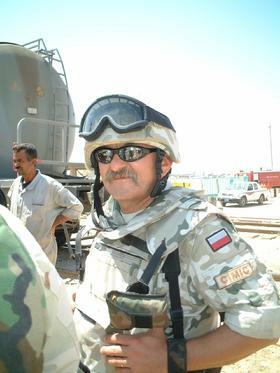 Polish Army Lieutenant Colonel Mariusz Saletra at the fuel depot in Ad Diwaniyah, Iraq on August 26, 2003. The visit was part of an introductory tour of the area to the newly arriving troops of the MultiNational Division - South.